uploaded Ninh Binh House through Add A Home. Ninh Binh is a quiet city 100km south of Hanoi. The buildings here are famous for their luxury, costly in appearance, but do not pay attention to the quality of living space, lack of natural elements, light and trees. 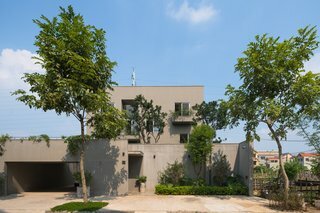 Ninh Binh house has a simple form, with reinforced concrete structure which is very popular in Vietnam, but designed to create a different kind of living space than the surrounding houses, closer to the nature. The house faces west, has an artificial lake and a large tree garden, which helps to cover the sun and regulate the air into the house. On the outside, a quiet, secluded garden, away from the hustle and bustle of the city. Inside, the corridors both create a space that connects people and nature, as well as the place where the daily activities of the family take place. The large void connects all the spaces of the house, enabling people to interact with each other and be closer to nature. The openings on the walls and roof ensure the house is well illuminated and well ventilated, while creating the natural viewpoints for every space of the house. Steel stair leading to the rooftop vegetable garden. The rooftop garden not only provides daily food for the family, but also a place to rest every afternoon. Taking advantage of the natural light, ventilation and greenery, the house has a pleasant atmosphere, friendly with the environment, saving the cost of lighting and air conditioning in living. The kitchen is separated from the common living space, suitable for the needs of the family. HGAA ensured that all the rooms of the home have a direct view of nature. The windows in the bedroom of the Ninh Binh House provide light and ventilation, while the outside greenery helps create the privacy needed for the interior space. Throughout the day, people always feel connected to the garden, with trees, wind and light. Nature becomes part of everyday life. The garden has become an indispensable element of the house, rather than just a decorative element as it often is in the surrounding houses. With the simplest design, bypassing the complex and unnecessary details, the house focuses only on factors that are truly valuable to people such as nature, light, wind and trees. to improve the quality of human living space.